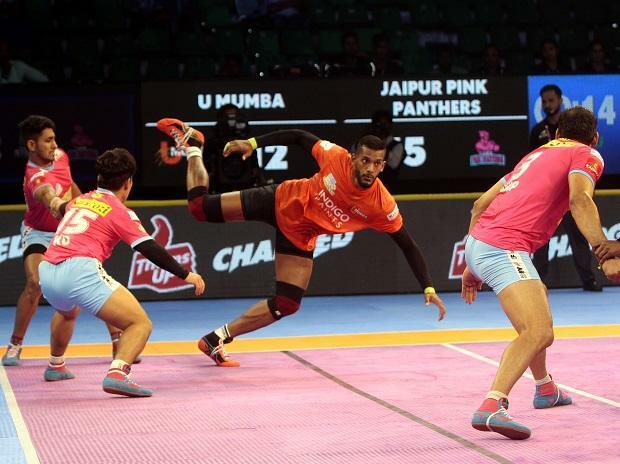 Star raider Siddharth Desai became the second-most expensive player in the history of the Pro Kabaddi League (PKL) when Telugu Titans picked him for Rs 1.45 crore on Day 1 of Pro Kabaddi 2019 player's auction Monday. Desai, in his debut outing last season, had picked 218 raid points from 21 games. Iranian kabaddi players dominated the first phase of the Pro Kabaddi League Season 7 auctions, with franchisees bidding for them intensely. Puneri Paltan retained the second highest sold raider Nithin Tomar and Gujurat Fortunegiants retained Parvesh Bhainswal. Marquee players Siddharth Desai, Nitin Tomar, Rahul Chaudhari, Monu Goyat, Rishank Devadiga, and Sandeep Narwal were the top buys in the auction, picked up by Teams Telugu Titans, Puneri Paltans, Tamil Thalaivas, UP Yodha and U Mumba. Mohammad Esmaeil Nabibakhsh was the highest valued international player, at Rs 77.75 lakh, bought by Bengal Warriors. As soon as the Maharashtra raider, whose base price was Rs 30 lakh, went under the hammer, Tamil Thalaivas made a direct bid of Rs 1 crore after which several franchisees fought hard to rope in Desai. Titans finally succeeded in bringing him home. Desai holds the record of being the fastest in PKL history to reach 50 raid points and is also the first rookie to score 200 raid points in a season. He was sold for Rs 36 lakh last year to U Mumba. Monu Goyat is still the costliest buy in the history of the league after the raider was bagged by Haryana Steelers for Rs 1.51 crore last year. The PKL 2019 auctions for foreign players started with a bang on Monday, as the first player named in the list -- Abozar Mighani -- drew everyone's attention. Gujarat Fortunegiants were the first to bid for Abozar before Dabang Delhi and Bengal Warriors got involved in intense bidding for the Iranian. U Mumba and Haryana Steelers too joined the bidding war and at one point it looked like Patna Pirates would have the last laugh with their Rs 75 lakh bid. However, they couldn't succeed as Telugu Titans exercised their Final Bid Match (FBM) right to rope in the Iranian for the second straight season. Abozar's compatriot Mohammad Nabibaksh too drew a lot of attention when placed under the hammer. After some frenzied bidding by the franchisee, all-rounder Nabibaksh, who had a base price of just Rs 10 lakh, was finally bagged by Bengal Warriors for Rs 77.75 lakh, making him the costliest foreign recruit this season. Surprisingly, Bengal Warriors showed no interest in retaining star South Korean raider Jang Kun Lee, as Patna Pirates bought him for Rs 40 lakh. Lee had spent the previous six seasons with Bengal Warriors and was a lethal weapon in their armory. Lee is the top-scoring foreigner in the league's history with 433 points. Meanwhile, it became clear that Patna Pirates wanted to boost it's raiding as after Lee, they bagged Iranian all-rounder Hadi Oshtorak for Rs 16 lakh. Another Iranian raider, Mohammad Maghsoudlou, attracted interest from U Mumba and Bengal Warriors in the early bids before they were joined by Haryana Steelers. But yet again, Patna Pirates had the last laugh as they picked Maghsoudlou for Rs 35 lakh. Despite the auctions featuring players from several countries, even from the United States, the Iranians dominated the proceedings from start to finish as another Iranian -- Amir Hossein -- found home in Haryana Steelers. His compatriot Saeeb Ghafari, a young defender, was pocketed by Dabang Delhi for Rs 16.5 lakh. Apart from the Iranians, the South Koreans too attracted some interest. U Mumba and Haryana Steelers locked horns for Korean raider Dong Geon Lee before the former roped him in for Rs 25 lakh. U Mumba also took home another South Korean, Young Chang Ko, for Rs 10 lakh. UP Yoddha then bagged Iran's Mohsen for Rs 21 lakh while defending champions Bengaluru Bulls roped in Nepal's Lal Manohar Yadav for Rs 10 lakh.